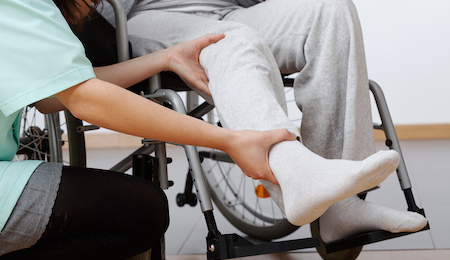 Physical therapy is offered as a subservice of home health care and services. When seniors are under home health care, the doctors and nurses will evaluate whether or not they need physical therapy treatment. Physical therapy is a quality remedy for many conditions that affect older people. One main concern is when seniors have falls. They can seriously injure themselves and need to seek physical care. To maintain some of their independence, seniors will need to gain their strength and endurance back. Physical therapy can also help them regain their flexibility, coordination, range of motion, and ability to complete everyday tasks. Seniors with arthritis or osteoporosis can benefit from physical therapy visits to improve posture and help reduce the pain. Seniors that have suffered from a stroke require learning new ways of mobility and use of limbs. When their brains are stimulated through movements and patterns, it can help the retrain the brain’s mobility. When one side of the body is nearly paralyzed, the functioning side is restrained so that it doesn’t take over all functionality. Seniors balance has deteriorated throughout the years and physical therapy will help get them back and feeling more comfortable on their feet. Self-Help for the Elderly cares about getting seniors up and on their feet. Even small movements and activity will help their bodies gain strength. In our home health care services, seniors are capable of receiving private physical therapy appointments from health care professionals. Give Self-Help for the Elderly a call today to learn more about our physical therapy services.